Technology is moving us forward at an increasing rate of knots. No sooner is one piece of new kit embedded in school before another one comes along that is slicker, faster, more fitting for your needs. It is nigh on impossible to keep up with such a fast pace and a clear remit for the use of technology is needed if we are to avoid jumping in with every new innovation that comes along. At Hawes Side we use technology in numerous ways but it’s core purpose is to stimulate, enhance and support learning. It is not as a bolt on but permeates the very fabric of school, part of its DNA. We have recently taken stock of where we are now with technology, what is embedded and working well, what requires attention, and what is no longer applicable. Some of the approaches covered here I have blogged about before but hopefully this provides a station stop on the technology train! Children at Hawes Side use a range of technologies and approaches in school, mirroring their informal learning out of school. Technology is part of each learners’ toolkit and as the children would reach for a pen, pencil or ruler, they will also confidently reach for a laptop, an iPod or iPad. Technology helps us blur the distinction between home and school, between formal and informal learning. It provides parents with a window on their child’s education and a gateway to shared learning experiences that can have a profound impact on children’s attitudes towards education. It means the world to most children, to have their parents and families not only show an interest in their learning, but to actively be a part of it. All the technology we use supports basic skills in some way or another. Parents are able to participate in their children’s learning journey every step of the way, and at every stage of their development. 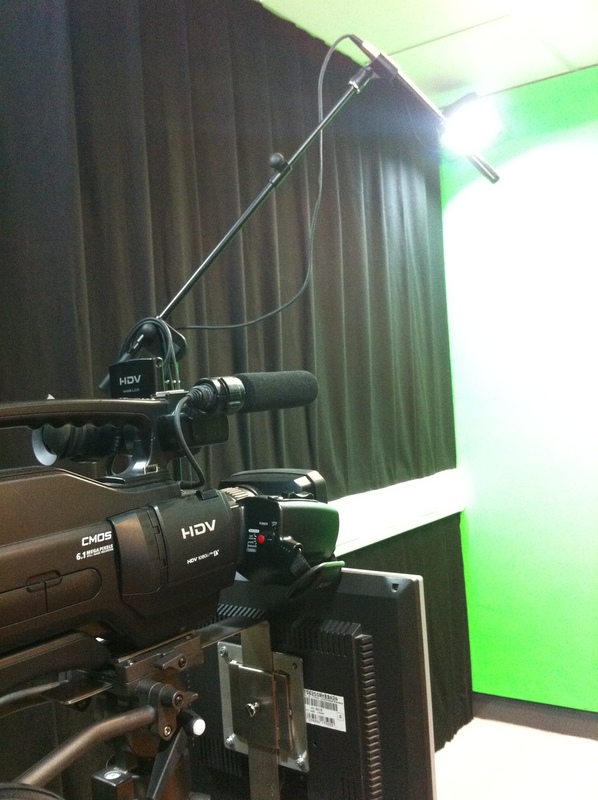 Reading, writing, speaking and listening are all developed through the innovate use of filming and green screen technology. From scripting, drafting, planning, writing and reading auto cues to presenting, reviewing and modifying performance, the technology supports and enhances the children’s learning. It isn’t seen as a gimmick but as a powerful tool to engage learners in these vital areas. One of the many benefits of using technology in this way is that the results of such experiences can be shared across the school community via a number of large screens around the school and beyond the physical building through the school blogs. Hawes Side school blogs are extensively used by all class and pupil groups as a powerful vehicle for learning in its many forms, and for sharing learning. The virtual environment forms a flexible e-portfolio providing children, and the wider school community with an online record of learning- easily accessed and shared. QR codes enable us to link online learning with traditional, non digital approaches. Using a QR reader to open web links not only excites and enthuses the children, it also allows them to quickly find the learning and links to learning that they require. Staff are well versed in the use of new technologies to support learning and further their own professional development. They continue to develop new, exciting and innovative approaches to their classroom practice that stimulate and motivate the children. We run staff surgeries each term to share ideas, approaches, web tools and apps that are working well in classes. We also use the surgeries to support each other with concerns and problems- to provide a coaching and collegiate environment that helps us move forward together as a community of learners. Piloting new ideas and approaches serves us well and gives us a chance to really assess the value of new initiatives before they become whole school. It is easier to monitor the success or failure of a new initiative in one or two classes than it is across twenty one at one time! Staff can visit each others’ classes to observe how a particular pilot is being played out. The use of the iPad as a teaching tool, with the whiteboard being used to mirror out via an apple tv is currently generating lots of interest across school, with those classes that don’t have this yet clambering to be part of phase two. Technology allows us to link immediately and meaningfully with our partner schools around the world. 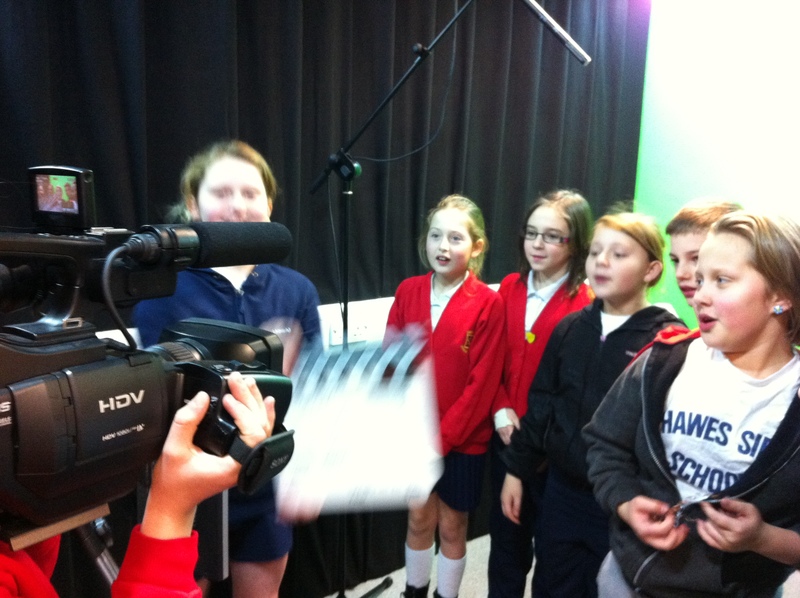 The children can collaborate with their peers in classrooms from Birmingham to Beijing, from Bolton to Berlin! Staff also fully embrace such partnership working, keeping in touch with colleagues in Australia and our European partner schools. Blogging is a fantastic way for our school community to support our worldwide connections, bringing real global learning into our classrooms. The use of technology has also seen a rise parental involvement and engagement. Families have the opportunity to become fully versed in new learning approaches with the school providing workshops and special events to support this. Recent experiments in live blogging have shown a healthy appetite for furthering IT skills that serve a real purpose. Parents and relatives have appreciated being able to stay in touch with the children whilst they are away on residential visits, learning along with them and sharing insights into what happens on such trips. Innovative approaches to homework involve parents and families like never before, links via the website and blogs keep the whole community informed and recent micro tutorials using the ‘show me’ app on the ipad enable to the children to record their learning to share with their peers and the world. Learning is discussed and shared- it is high profile in the home as well as the school giving children a powerful positive message that says learning doesn’t stop at 3.30pm, nor is it confined to a school building- learning is everywhere, learning is collaborative and learning is fun! Learning for the community of Hawes Side extends beyond the school gates. It is not restricted by time or place. Learning for the children of Hawes Side is not an insular experience, it has a real, worldwide audience who are easily reached, encouraging and supportive and hugely interested in sharing and participating in collaborative approaches to learning. Technology is changing the way we think, teach and learn. It is providing the children with opportunities like never before. It is up to us to engage with, manage and ultimately embrace these opportunities. A bit of a novelty! I entered the primary teaching profession in the early 90s. I remember my first class having a computer. An Acorn computer! The school also had some BBC computers, one or two children used them for special programmes that could be purchased on floppy discs. I remember buying one such programme to help children with dyslexia. The computers were not part of the furniture yet, they were a bit of a novelty and their potential limited to a small number of children. That pattern of use continued in my first few schools. One or two computers might be in a class (or on the corridor) with a small number of programmes being used by a small number of children. I remember buying my first computer to find out what they could do, my 3 year old son spent endless hours on James Pond – now there was a game! The situation seemed to change towards the end of the 90s and I can remember arriving at my new school as Deputy Head and seeing an IT suite being installed. This was the future! At St Peter‘s we not only had an IT suite (with approximately 15 computers) but some classes also had a bank of four computers to support learning. The popular programmes of the time were starspell and maths wizard. We also used textease to develop children’s skills with simple cutting and pasting, changing font sizes etc…Heady times! I don’t recall anything too adventurous happening and if the programmes crashed we’d have to wait for the technician to make his weekly visit to school to put things right. We’re not talking about an indispensable tool here! Children would be timetabled to use the class computers and to use the IT suite (half the class would go and develop their ‘skills’ while the other half stayed in class) the whole experience was ‘add on’ rather than ‘integrated’. My move into headship coincided with the epiphany that was the interactive whiteboard! Suddenly a new tool had arrived that everyone in the class could benefit from. Initially one or two classes had IWBs and we would timetable those classes out to everyone. Eventually we were able to fund IWBs in every class which made life much easier and timetabling less of a chore! As I moved onto my second headship IT suites were just about to be demonised! ICT was now beginning to be seen as integral to the curriculum as a whole, as something to permeate learning across the board rather than as a discrete subject with its own equivalent to the science lab. Hawes Side had must have been one of the last schools to have an IT suite built before they went out of fashion! The move to mobile learning helped move IT into common parlance around the school. It isn’t a lesson taken twice a week in the IT suite, it is readily available at all times to support learning. The rise in the number of laptops around the school and lap trolleys to move class sets from one place to another has provided an further opportunity to support the children’s learning with technology. The growing number of laptops and netbooks has recently been complimented by the introduction of handheld devices. Like many other schools, we have begun to use itouches with the children bringing the learning experience closer to home. The children are happy and excited to use the itouches, they quickly understand its capabilities and readily push their learning with them. The use of video conferencing has also grown over the last few years with the children and staff now considering its possibilities to enhance the learning experience when planning a new topic. The rise of web 2.0 has opened up more possibilities than you could shake a stick at, it has given schools the opportunity to move learning from the local to the global, to help develop learners for a changing world, to make a difference in a world of difference. It is a challenge that the best teachers readily respond to. 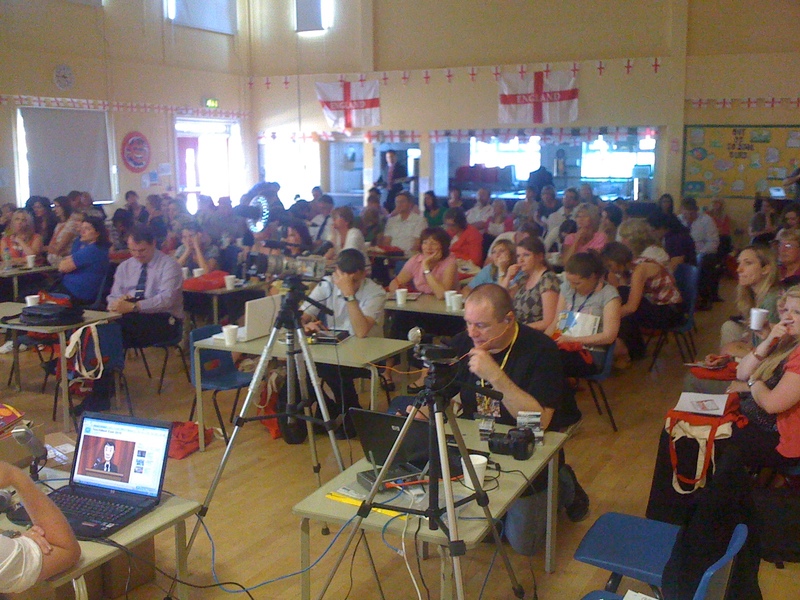 Last night saw the second teachmeet Blackpool courtesy of some stirling work once again from @mr_jim and @tomsale. 140 people turned up for an evening of great presentations from a host of educators from across the country. As 4.30 approached, the hall at Hawes Side swelled to near capacity. Late comers were relegated to extra seating down the sides as local teachers and the twitter community mingled with a group of European visitors from Lithuania, Romania, Denmark, France and many other countries. Prof Stephen Heppell kicked off the proceedings as @eyebeams ensured the event was streamed over the net for those who couldn’t make it in person. We were then inspired, informed, illuminated and entertained by a range of practitioners, teachers and consultants who selflessly got up to share great ideas and innovations. The evening was punctuated with a fantastic spread of butties and cakes which I battled my inner demons to leave alone till 6pm! 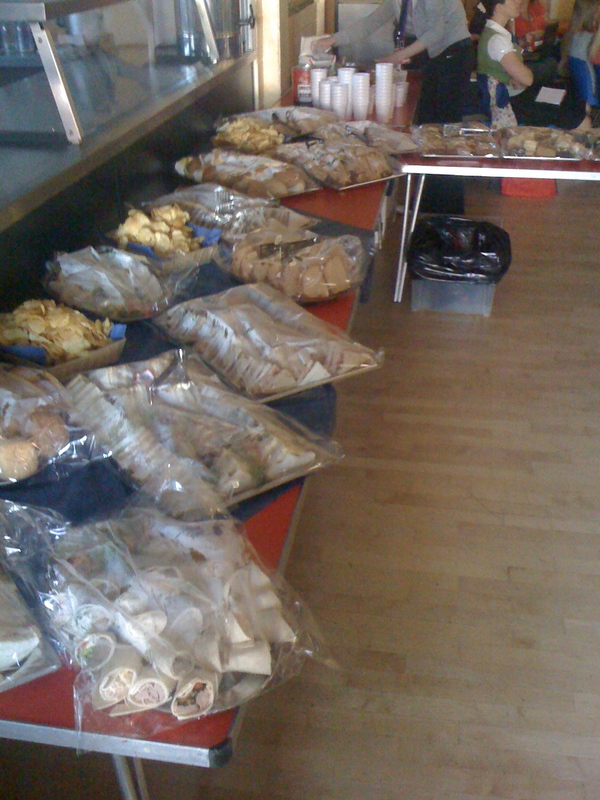 Some people must have been very polite about their portions as the initial order for 120 delegates easily covered a greater number. Following a ‘networking and eating’ break we got back on with some fantastic presentations. It would be wrong in some ways to single out individual ones but I think everyone would agree that finding out all about Giraffe Class and their tweets from @joga5 was great! Finding out all about Colin and rickrolling from @ZoeRoss19 was unexpected! And @HGJohn’s blogging the world cup was a brilliant, topical idea well worth sharing. I didn’t realise just how much you could do with PowerPoint until @bevevans22 showed us and some fantastic examples of blogging with young children from @jacksloan blew me away. Staff from Hawes Side left full of requests for Purple Mash following @simonhaughton’s presentation and great ideas for voicethread and coveritlive from @primarypete_ and @DeputyMitchell respectively only served to further convince staff of their ease of use and obvious benefits. All in all a fantastic, inspirational evening that cannot have failed to have left all who attended full of enthusiasm and desperate to try out new ideas back in class. If you leave teachmeet with one new idea, then it’s worth it. Last night proved the unconference format has a massive impact on practitioners (both those who attend and those who watch online) and huge potential to develop even further, to the benefit of all who care passionately about education. Our teaching and learning group recently developed a project using wallwisher. For those people who haven’t used wallwisher before, it is a very simple to use web 2.0 tool that acts as an interactive, web based post-it board. We have worked with partner schools in Australia for a few years now and always used video conferencing to connect the children to allow them to share their work. We have to connect at certain times of the year when the timings are just right, which isn’t always ideal. Subsequently, the VCs tend to be about sharing end results and we wanted to share the working process this time. Wallwisher has enabled the children to ask each other questions, share ideas and thoughts as they occur which has allowed us to share in a different way. For this particular project we have been looking at the qualities of effective learners. This is the culmination of a lot of work the teaching and learning group have been engaged in for the past couple of years with our partner schools in the Kaizen Group. We have researched Guy Claxton and Chris Quigley’s work with the children looking at the practical ways of being reflective, resourceful, resilient and risk taking learners. The wallwisher enabled the children to share their thoughts on how these qualities can help us become more effective learners. Our partner schools’ teaching and learning groups contributed their own thoughts on the qualities of effective learners and the contributions gave us more food for thought generating further discussions within our group leading to more practical ideas within school. The teaching and learning group are currently using the findings of this wallwisher project to help them in creating a resource to help their peers in assessing which effective learner qualities they possess and which they need to develop further. Wallwisher is a simple tool that has lots of potential to support learners in and out of the classroom, we are certainly benefiting from this user friendly web 2.0 tool.